I’ve had the Astroscan® Millennium for about a month now, and I’m really excited to share what I was able to capture with it! I wanted to showcase that the Astroscan® Millennium is able to create the the same style of images most associate with a more advanced and extremely expensive telescopes. While this image maybe a Millennium 301 level instead of the Millennium 101 level my other blogs have been (and will continue to be) I felt this was too impressive of a photo not to share with everyone and show what the Astroscan® Millennium is capable of. 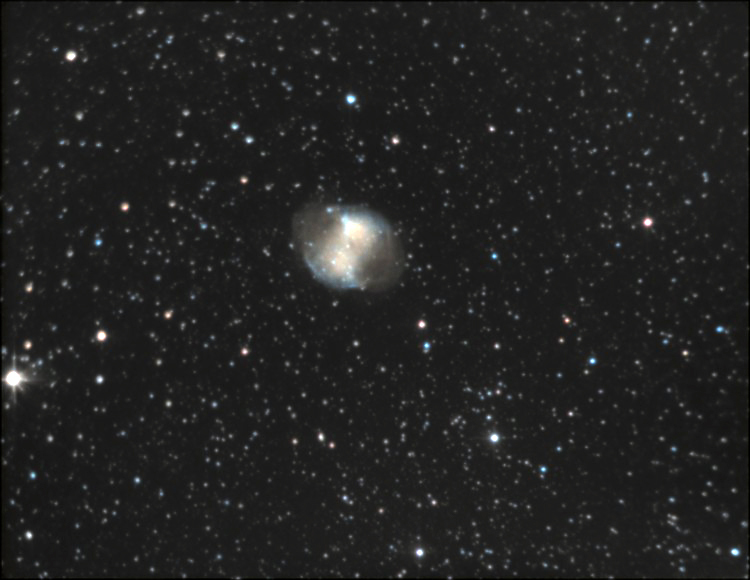 What you’re looking at is the M27 Dumbbell Nebula – I’m going to give a quick overview on how you would go about creating something like this yourself, but first lets start with the obvious. Unlike all the other photos in this blog series, there is a more advanced photography going on besides the point & shoot I’ve done in the past. Images like these are processed / composite images, meaning more than one shot is being used to make up the final product you see. I believe that it is something most amateur astronomers would be able to create themselves with the right gear and a little bit of practice if they wanted, which is why I’m inducing it here. I have an adapter that allows me to hook up my digital SLR camera to the Astroscan® Millennium. Once my camera was hooked up I set it to take a long exposure, meaning the camera shutter stays open longer allowing for more light to get through the lens of the camera. These long exposures allow for colors and details that are not able to be seen with just the human eye to come out. The more advanced (and expensive) telescopes I mentioned earlier, have computerized mounts that track the stars as they move across the night sky. These telescopes can take images like this in only a few shots by using exposure times of 15, 20 or even 30+ minutes. The Astroscan® Millennium does not have one of these advanced mounts, so I set my exposure time to only 30 – 40 seconds. This is the most amount of time I could have before the stars started to move too far in the telescopes field of view and the image starts to become blurry. After each exposure I would move the telescope slightly, re-centering the M27 Dumbbell Nebula in the frame, and take another exposure. I repeated this process about 140 times and then loaded all the images into software that stacks and centers all of the images I took on top of each other, creating what you see above. While not the easiest process to do, I feel the results are more then worth the time and effort it takes to create them.